This week's treat is a 10 pack of Nestle Drumstick Lil' Drums. You get two flavors in a box with 5 lil' cones of each flavor. My box has Chocolate Fudge Brownie and Cookie Dough. They are a minor 2.25 fluid ounces a piece that clock a mere 140. Despite being frozen dairy dessert, they still clock the high saturated fat content of their bigger brothers. Actually, I want to apologize for the delay of this review. I hate to say it, but my first sample was actually 8 weeks ago. I had to run out at night and grabbed a Cookie Dough flavored one on the way out the door. The "problem", if you can call it that, is that these lil' guys are so small, I was done in no time. Since I could barely remember the encounter, I decided to be fair and wait til I could try them a few more times before posting. Well, I've had 2 or 3 of these this week, so now I'm ready. First off, and I know I stress this every time, but ice cream companies, please hear this: If you can't keep the cone crunchy, don't bother making this kind of snack. In my mind, Nestle is the master of the crunchy cone. Think of it this way: these lil' guys have been in my freezer two months and they're still crunchy!! That's top notch food engineering for you. Lastly, they maybe small, but they still have that great drumstick taste and the drumstick quality. Wait, that's not fair. 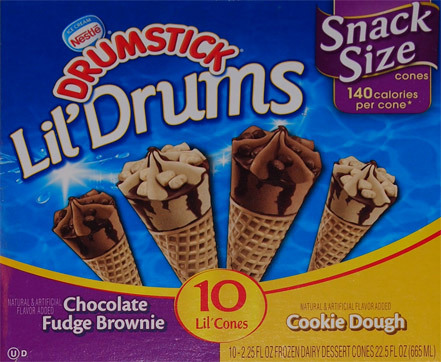 These are new flavors we find here in Lil' Drums and I'm glad to see drumstick branching out like this. Good job Nestle. I LOVED these! And as someone watching her weight, I'm sooo glad they are so small. I can eat a full one and not feel like I only had half a serving. 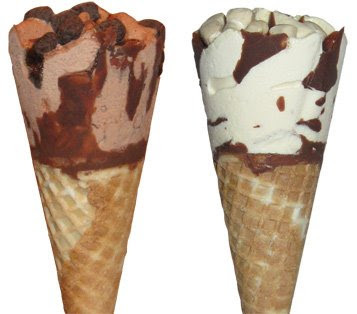 It feels like a full dessert, from top of the ice cream to the tip of the cone! I've been enjoying these products, but in my most recent box I feel like they are suddenly even smaller - and there's much less chocolate! What gives, Nestle?